tour starts with visiting Sameba (Holy Trinity) and Sachino Palace with convent - this was the "summer palace" of Queen Darejan, then walking to Metekhi temple - King Vakhtang I Gorgasali erected here a church and a fort which served also as a king’s residence; hence comes the name Metekhi which dates back to the 12th century and literally means “the area around the palace”. Jvaris mama - The Jvaris Mama Church has been a church since the 5th century. The current structure dates from the 16th century; its frescoes were recently restored in striking reds and blues, and the atmosphere is exquisitely pious and calm. day start with mount Mtacminda with church and pantheon of famous writers actors,actresses and others, you will enjoy with beautiful view from here of Tbilisi. then you will walk down at the Rustaveli avenue - main street of Tbilisi, where you can buy some souvenirs and see simple citizens of Tbilisi, famous brand shops. tour for this day starts with visiting open air museum of ethnography - It is located in Tbilisi's Vake district, to the west of "Turtle Lake". 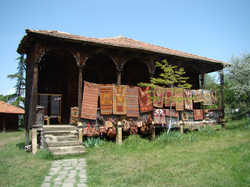 It occupies 52 hectares of land and houses more than eight thousand artifacts brought from all over Georgia.The Open Air Museum encompasses 14 ethnographic zones: Kartli, Samegrelo, Adjara, Abkhazia, Svaneti, Khevsureti, Kakheti, Meskheti, Javakheti, Guria, Imereti, Racha, Lechkhumi and Ossetia. then you will have opportunity to visit churches of other religious in Tbilisi such as: Synagogues - known as the Great Synagogue. It was founded by Jews from Akhalcikhe, who settled in Tbilisi in the late 19th century, hence its second name, “synagogue of the people of Akhalcikhe”. also you will see new synagogue. Saint Peter and Paul catholic church - was built in 1870-1877 with the order of Konstantine Zubalashvili, the head of Roman-catholic parish and the supporter. The Roman Pope Paul the II visiting Georgia in 1999 performed the mass in st.Peter and Paul church. dinner at the traditional restaurant and walking at Agmashenebeli street. price includes: hotel accommodation 2 nights 3*.